14 years ago today, it was time to play ball. In any year before that or since, playing baseball on a mid-September day would have been quite the norm. But in 2001, September 17th was anything but normal. 6 days before….well, we all know happened that day. And MLB made the right call by shutting down for several days while we all mourned, cried, and tried to make sense of what had happened. 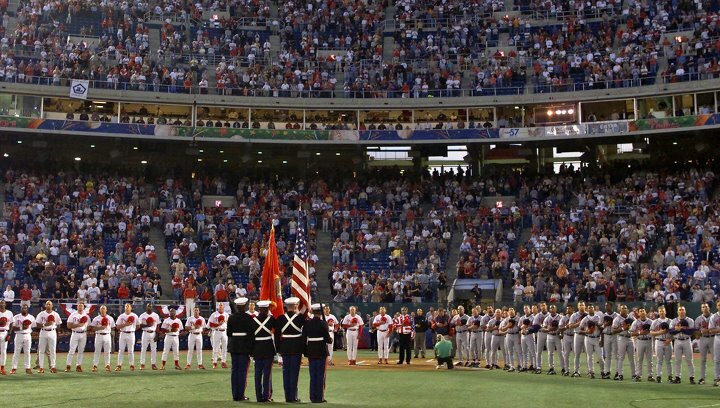 On September 11th, the Phillies were scheduled to start a critical series against the Braves in Atlanta. Trailing by 3 ½ games, that was supposed to be the chance to start a final push and get back into the race. By the time games were ready to be played again, it was 6 days later and the Phillies were home to face off against….the Braves. From a strict baseball/pennant race perspective, it was if the past week had not happened. In reality, of course, no one felt that way. I have a lot of memories of that game on 9/17/01. Harry Kalas’s voice choked up several times as he did the pre-game. Larry Bowa cried during the National Anthem. Nothing felt normal, nothing at all. There was no excitement of a pennant race. There was no intensity of facing a tough opponent. There was no discussion of how the Phillies would deal with facing Greg Maddux. Baseball, it seemed was to be yet another thing that we were robbed off. I remember watching the first two batters and being rather numb. It felt impossible to have feelings at all about something so un-important. And then, with 2 outs and no one on in the first, Chipper Jones hit a Home Run. 1-0 Braves. The feelings all started to come back. “Awww, Jeez! How do you give up a run like that right there?? You can’t fall behind to Maddux! Alright…we have our work cut out for us tonight.” And ever so slowly, things started to feel normal. The Phillies went on to win the game, but I’ll always recall Chipper setting things right again. I agree. It was very touching for me to see all of those people get so choked up just because it was my birthday. Oh, wait, that wasn’t it? Yup. LOL. I wish. Unfortunately, I had already had 33 other birthdays before 2001! Our hero with feet of clay.